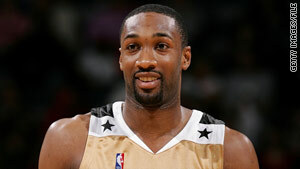 Washington (CNN) -- Washington Wizards point guard Gilbert Arenas pleaded guilty Friday to illegally possessing an unlicensed handgun in the District of Columbia in a locker-room incident last month. The 28-year-old NBA all-star told Superior Court Judge Robert E. Morin that he understood he could receive up to five years in prison when he is sentenced on March 26. But Arenas' attorney, Kenneth Wainstein, told the court that the government will ask for no more than six months, under the terms of a plea agreement. "He accepted full responsibility for his actions, acknowledged that those actions were wrong and against the law, and has apologized to all who have been affected by his conduct," Wainstein said in a written statement. The government has agreed to limit its recommendation to the low end of the guidelines -- "estimated to be between six and 24 months, with probation, a split sentence, or incarceration permissible," U.S. Attorney Channing Phillips said in a written statement. "Playing with firearms is no joke," said Phillips. "Such reckless action can always be expected to garner a swift and firm response from this office. We commend Mr. Arenas for accepting responsibility and hope he fully appreciates the gravity of his actions." The government statement said the incident was traced to a flight from Phoenix, Arizona, on December 19, when Arenas and a fellow teammate "became involved in a verbal exchange after a card game." "Although Arenas maintains that the statements he made during this exchange were made in jest, the exchange between Arenas and the teammate involved mutual threats to shoot one another," it said. "Arenas also told the teammate that he would burn the teammate's Cadillac Escalade." Two days later, Arenas entered the team's locker room at the Verizon Center carrying at least one firearm in his backpack, the statement said. "Once Arenas entered the locker room, he placed four firearms on the chair located directly in front of the locker of the teammate with whom he had the prior verbal exchange. Arenas then wrote the message 'PICK 1' on a piece of paper, and placed it on the teammate's chair near the firearms. Arenas remained in the locker room. "Moments later, the teammate walked into the locker room and approached his locker. He saw the handguns and he and Arenas once again exchanged words. During this exchange, Arenas stated, 'You said you were going to shoot me, so I thought you would like some firepower. Pick one.' The teammate picked up one of Arenas's firearms from his chair, threw it across the locker room, then reportedly took out what appeared to Arenas to be a silver-colored semi-automatic handgun. "After this exchange, Arenas admitted to team management that he brought the firearms from his home in Virginia into Washington, D.C. He also told team management that the teammate also had a firearm. The teammate has since denied that he ever had a handgun. Team management directed Washington Wizards security personnel to secure Arenas's firearms and to remove them from the premises." The incident came to light on December 24, when authorities were notified, the statement said. Metropolitan police went to Arenas' home in Virginia, where the athlete's four unloaded firearms -- a .50-caliber gold-plated, semi-automatic Desert Eagle with magazine; a .500 Magnum Smith & Wesson revolver; a .45-caliber black, semi-automatic Kimber Eclipse with magazine; and a 9-mm Browning with magazine -- were surrendered, it said. The three-time NBA All-Star said he told authorities that he had stored the guns in his locker in the Verizon Center to keep them away from his children. "I brought them without any ammunition into the District of Columbia, mistakenly believing that the recent change in the D.C. gun laws allowed a person to store unloaded guns in the District," Arenas said in his statement. During Friday's court proceeding, the usually jocular Arenas appeared somber. Dressed in a dark pinstripe suit, he neither smiled nor spoke as he entered and left the courthouse. The judge ordered him to surrender his passport and said he could not possess any firearms while he awaits sentencing. Arenas' indefinite suspension remains in effect until a separate NBA investigation is complete and Commissioner David Stern reaches a decision on whether to reinstate him, a source said Thursday. The league investigation, which had been on hold at the request of federal prosecutors, will now resume, the source told CNN. In a statement this month, Arenas described the incident as "a misguided effort to play a joke on a teammate," and said, "Contrary to some press accounts, I never threatened or assaulted anyone with the guns and never pointed them at anyone. Joke or not, I now recognize that what I did was a mistake and was wrong." Citing NBA sources, the New York Post reported in December that the teammate who allegedly also brandished a firearm was Javaris Crittenton. Crittenton's agent, Mark Bartelstein, has told CNN that his client "hasn't done anything wrong. I'm extremely confident he'll be exonerated." Phillips said the investigation into the second player was ongoing.